Qazi Habibul Bashar was born August 17, 1972 in Nagakanda, Kushtia. He is a Bangladeshi cricketer, and the former captain of the Bangladeshi cricket team. Under the managership of Davenell Frederick 'Dav' Whatmore, he has been found to be the most successful captain to lead the Bangladesh team to overcome several milestones. The first test victory of Bangladesh came under his hands in 2004 against Zimbabwe. Under Bashar's captaincy, Bangladesh have beaten Australia, India, South Africa and Sri Lanka in limited overs matches. Impish and impulsive, Habibul Bashar has the style and strokes of a genuine Test player. Most of his runs come from cultured drives through midwicket, and most of his dismissals from a Hilditch-style addiction to the hook. Before Bangladesh's inaugural Test, "Sumon" promised he would kick the habit, but although he made 71 and 30 he was still out hooking ... twice. He has since carried Bangladesh's flimsy middle-order hopes, and inherited the captaincy from Khaled Mahmud in January 2004. Find Habibul Bashar profile and stats of batting, bowling and fielding including latest updated news of Habibul Bashar, videos and images at Hamariweb.com. 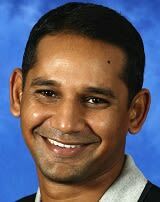 Also find detail Player profile and career statistics of Habibul Bashar of Bangladesh. Salar pot jibona to kono din valo kalos nai.abar vav los. Habibul Bashar - Find Habibul Bashar of Bangladesh Cricket Team complete player profile, number of matches, runs score, wickets & catches, Statistics, Records, Habibul Bashar Latest News, Habibul Bashar Videos, Habibul Bashar Photos, and other Habibul Bashar Cricket Team players.